Pregnancy and the first few years of raising children can cause loose, excess skin to appear in a number of body areas, including the buttocks. If traditional diet and exercise is not having a significant effect on improving the appearance of the buttocks, a buttock lift from Dr. Tom Lintner may be a good option to include in your mommy makeover procedure. This treatment can remove excess, sagging skin from the buttocks for a more toned and athletic appearance. 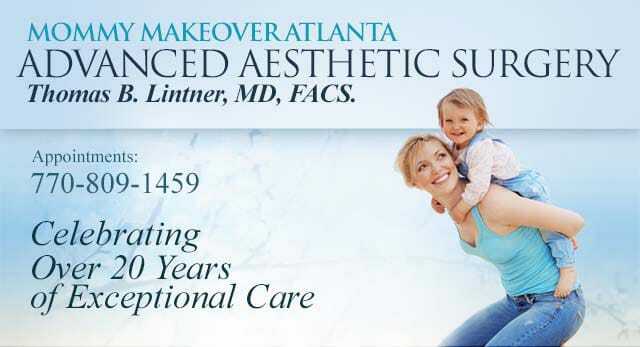 Please contact Dr. Lintner for more information on buttock lift surgery and other mommy makeover options. A buttock lift can help the buttocks achieve a better proportion to the rest of your body, addressing asymmetry issues and eliminating excess skin that can cause a sagging appearance. During a buttock lift, Dr. Lintner will remove loose, extra skin in the area and pull the remaining skin taut. This has an effect of smoothing out the skin of the buttocks and giving it a firmer appearance. Buttocks lifts can be done at the top or the bottom of the buttocks, depending on your specific concern. Some patients can benefit from a fat transfer to the buttocks to give more projection to the middle portion of the buttocks. Fat is harvested from other areas of the body, washed and then transferred to the area of the buttocks that requires augmenting. Recovery from buttock lift surgery typically takes a few weeks, with most patients able to resume normal daily routines within the first three weeks after surgery. However, exact recovery details will depend on the other procedures involved in your mommy makeover. Dr. Lintner will explain all aspects of buttock lift and the other treatments you are considering as part of your mommy makeover at the initial consultation. He will be happy to answer all of your questions and address any concerns you may have. If you would like to learn how a buttock lift can significantly rejuvenate the appearance of your buttocks after pregnancy, we invite you to contact our practice for additional information.